Three Irish students from Cork, who won the BT Young Scientist Exhibition, have won a prestigious global science competition. 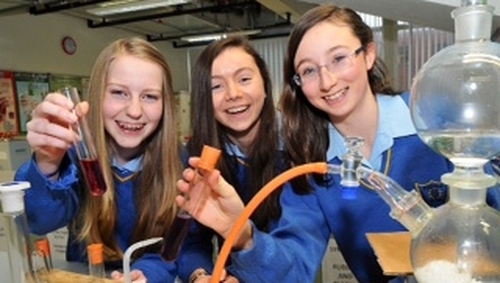 Ciara Judge, Emer Hickey and Sophie Healy Thow beat 17 other finalists to scoop the grand prize at Google Science Fair in California. Two years ago, the three then-third year students from Kinsale Community College in Cork won top honours at the BT Young Scientist and Technology Exhibition. They discovered that a naturally occurring bacteria in soil could be used to speed up the germination process of certain crops by up to 50%. They then went on to scoop the top award in their category at the EU Young Scientist of the year competition. However, now the three students have done it on the global stage. Their project was deemed the overall winner of the prestigious Google Science Fair in California. The competition received thousands of entries from more than 90 countries, which were whittled down to 18 finalists. The Irish students will receive a ten-day trip to the Galápagos Islands, a chance to participate in astronaut training and a $50,000 scholarship from Google. Meanwhile, Irish student Paul Clarke has scooped the CERN prize at this year's EU Contest for Young Scientists, which is taking place in Warsaw. The pupil of St Paul's College in Raheny in Dublin was representing Ireland at the contest, after he won the national competition in January. His project titled "Contributions to cyclic graph theory" saw the teenager solve long unanswered mathematical problems. Graph theory is a mathematical means of analysing structured data that can be captured in a graph. For winning the EU competition, Paul will spend a week at the Geneva-based European particle physics centre, CERN. Paul has also won second prize overall for Mathematics at the EU Contest for Young Scientists in Warsaw. He wins €5,000. It is the fourth year running that Irish students have been among the top flight of winners at the EU competition. Last year, Ciara Judge, Emer Hickey and Sophie Healy Thow from Kinsale Community School, who last night won the Google Science Fair, took one of the three first prizes for their project on the effects of diazotroph bacteria on plant germination. In 2012 Mark Kelly and Eric Doyle from Synge Street CBS in Dublin won a first prize for their project 'Simulation accuracy in the gravitational many-body problem'. In 2011, the top prize in the engineering category went to Alexander Amini from Castleknock College, also in Dublin, for his tennis sensor system.